Year 9 students at Blayney High School presented Veritas House SHS staff Sarah Luff (back) and Tiffany Stonestreet (centre) with the proceeds from their campaign. Photo courtesy of Blayney Chronicle. 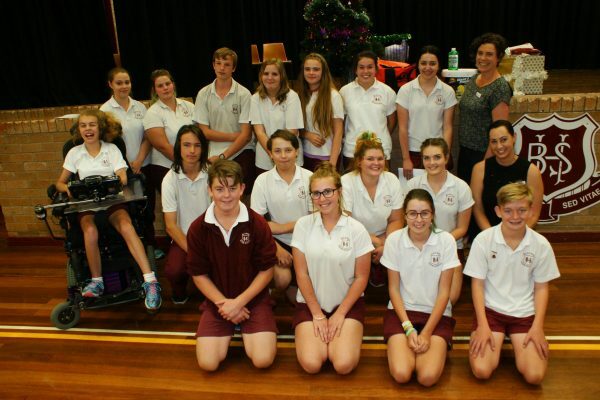 Year 9 students from Blayney High School conducted a two week campaign at the end of term last year to raise funds for Veritas House as part of their Social Issues – Disadvantaged Youth and Homelessness studies in English. The students brainstormed a range of fundraising ideas and, after consultation with teaching staff and Veritas House, implemented a range of activities. In addition to a cake stall, raffle and barbecue which raised an impressive $1,284, students called for donations of clothes, canned food and Christmas gifts, all of which were distributed to young people staying at the Veritas House youth refuges in Orange and Bathurst over the Christmas period. “All of our staff are passionate about the work that we do and the young people, children and families that we assist; and we are delighted that Blayney High students share our enthusiasm for doing everything we can to support young people in Bathurst, Orange and surrounds who are experiencing or at risk of homelessness. The initiative and creativeness shown by Blayney High students is a credit to themselves, their loved ones and communities. Thank you and well done Blayney High, you shine a bright light on our future,” said Veritas SHS Team Leader, Sarah Luff. The funds raised by BHS were used to fund trips to Lake Lyell near Lithgow and to the Elvis Festival at Parkes; and to purchase additional Christmas presents for the residents of the refuges.